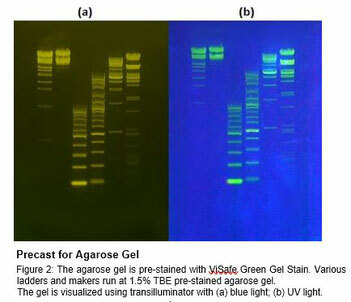 ROX reference dye or Evagreen DNA Stain are used in realtime PCR or RT-PCR. 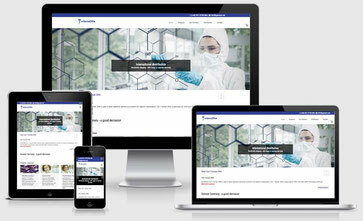 GelRed from Biotium is a real alternative to Ethidiumbromide but GeneON's GelRed offer is without alternative. GelRed™, GreenGel, and RedGel are highly sensitive either as precast gel stains or post gel stains. GelRed™ is much more sensitive than EtBr, and at least as sensitive as or brighter than SYBR® Gold in post gel staining. Unlike SYBR® Gold, GelRed™ can also be used as a highly sensitive precast gel stain, and is available as a prestain loading buffer. GelGreen™ is spectrally similar to SYBR® Safe but is far more sensitive, and can be used with blue light gel imaging systems like the DarkReader®. PAGE GelRed is designed for staining DNA in acrylamide gels. Another major advantage of GelRed™ and GelGreen DNA stain is their remarkable stability. You can store and handle the two nucleic acid staining dyes the same way you do with EtBr. 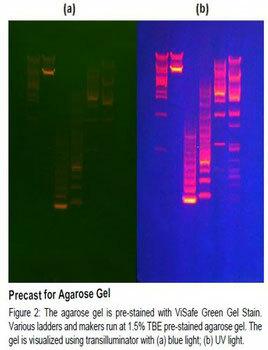 GelRed can be used to stain double-stranded DNA, single-stranded DNA or RNA in agarose gel.